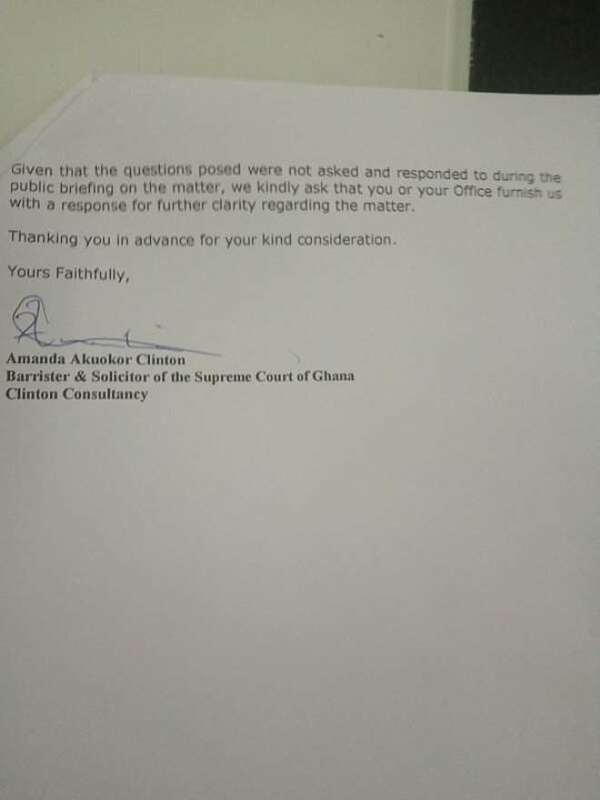 Ms. Clinton's letter to Deputy AG Kpemka is not to doubt his allegations as to NAM1's acquittal, but to ask for further clarification about whether there exists confirmation further than a WhatsApp message to his phone and a subsequent phone call about the acquittal. Ms Amanda Akuokor Clinton Esq. represents a number of Menzgold's customers in court and has been instructed by customers in relation to locked up fund at TCL and Unicredit. As an international lawyer with 13 years experience in London and a combined 10 years at the Ghanaian Bar this commercial lawyer is also becoming a rights lawyer for commercial agreements gone wrong. My name is Ms. Amanda Akuokor Clinton and I'm a lawyer based in Accra. I represent a number of Menzgold customers regarding their locked up funds with Menzgold Ghana Limited and their sister company Brew Marketing Company. 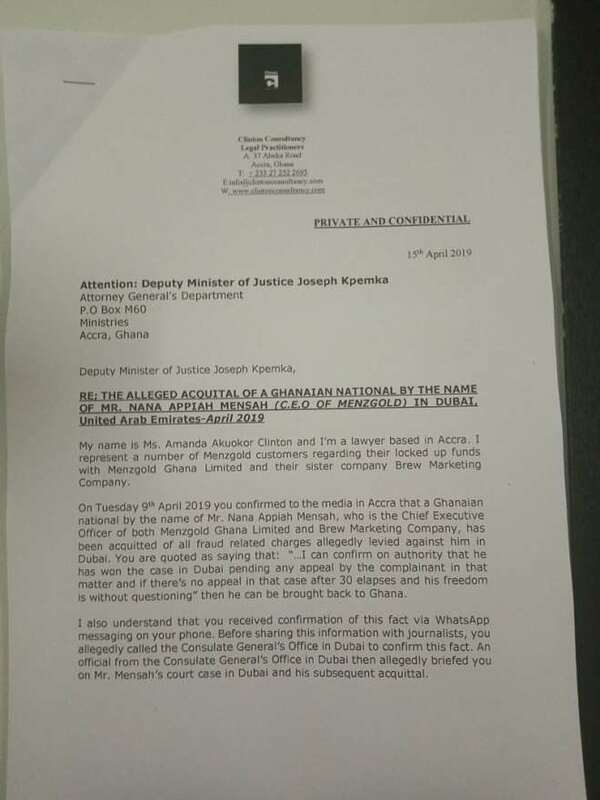 On Tuesday 9th April 2019 you confirmed to the media in Accra that a Ghanaian national by the name of Mr. Nana Appiah Mensah, who is the Chief Executive Officer of both Menzgold Ghana Limited and Brew Marketing Company, has been acquitted of all fraud-related charges allegedly levied against him in Dubai. You are quoted as saying that: “…I can confirm on authority that he has won the case in Dubai pending any appeal by the complainant in that matter and if there's no appeal in that case after 30 elapses and his freedom is without questioning” then he can be brought back to Ghana. I also understand that you received confirmation of this fact via WhatsApp messaging on your phone. Before sharing this information with journalists, you allegedly called the Consulate General's Office in Dubai to confirm this fact. An official from the Consulate General's Office in Dubai then allegedly briefed you on Mr. Mensah's court case in Dubai and his subsequent acquittal. 2. 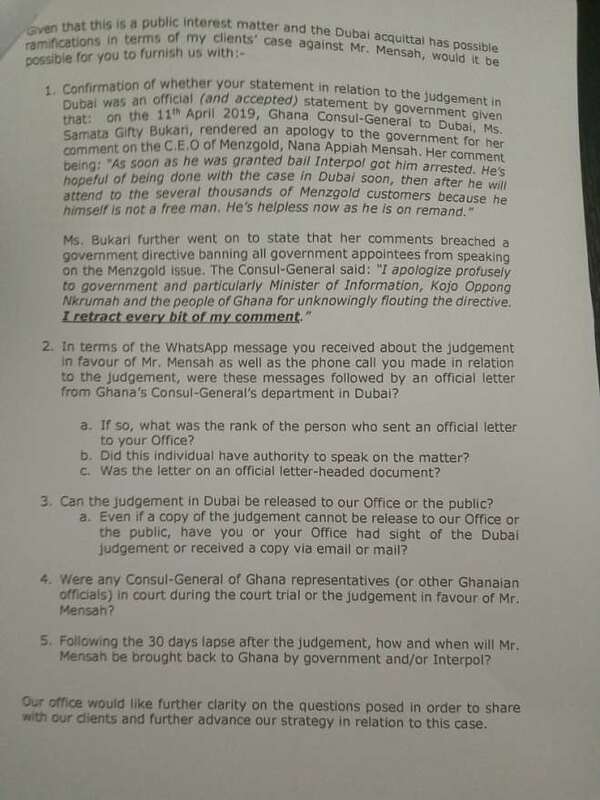 In terms of the WhatsApp message you received about the judgment in favour of Mr. Mensah as well as the phone call you made in relation to the judgment, were these messages followed by an official letter from Ghana's Consul-General's department in Dubai? b. Did this individual have authority to speak on the matter? 3. Can the judgment in Dubai be released to our Office or the public? a. Even if a copy of the judgment cannot be released to our Office or the public, have you or your Office had sight of the Dubai judgment or received a copy via email or mail? 4. Were any Consul-General of Ghana representatives (or other Ghanaian officials) in court during the court trial or the judgment in favour of Mr. Mensah? 5. Following the 30 days lapse after the judgment, how and when will Mr. Mensah be brought back to Ghana by government and/or Interpol?